If you are one of millions of Americans who are considering buying an annuity, you may be feeling a bit overwhelmed. There are literally thousands of websites you could visit to help sort things out…but you may end up feeling even more confused than when you started. There’s no question that annuity products can be very complex and, on top of that, there are hundreds of annuities from which to choose. Which one will be best for you? Making the right choice will be critical to helping secure your retirement future. Meet Cathy DeWitt Dunn and Matt Redding of DeWitt and Dunn. They have over forty years of collective experience as retirement income planning and annuity experts. They have helped thousands of individuals and families learn how to protect and grow retirement assets, create income that can’t be outlived, and provide a financial legacy for future generations, all while eliminating stock market risk. In fact, despite the economic roller coaster over the past eleven years, Matt and Cathy’s annuity clients haven’t lost a penny due to stock market volatility. This is powerful evidence of expertise that could be put to work for your benefit. Is the person you are considering working with independent? Or is he or she tied to selling specific products? How long have they been in the business? How many people have they helped? Will they provide client references? Real people you can talk to? Do they have a clear, concise message that’s educational instead of sales-y? Does their educational material make sense? Are you comfortable with them? Can they answer all your questions? 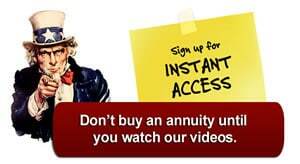 To learn more about how annuities actually work, check out Cathy’s free educational video series at annuitywatchusa.com. These videos offer an inside look at high quality fixed income products, including fixed index annuities, which can provide you retirement income planning flexibility and a powerful growth component. Also, join Cathy and Matt each week on their nationally syndicated radio show, Safe Money Talk Radio, as they share their experience and insights on meeting the retirement challenges faced by millions of Americans today. An easy way to see if your retirement income strategy measures up is to sign up for our free video series, “Securing Your Retirement Future,” which helps educate you on how fixed index annuities work…and how you can use them to GROW AND PROTECT your retirement assets.